The U.S. president ranted against what he called a "massive gas deal." 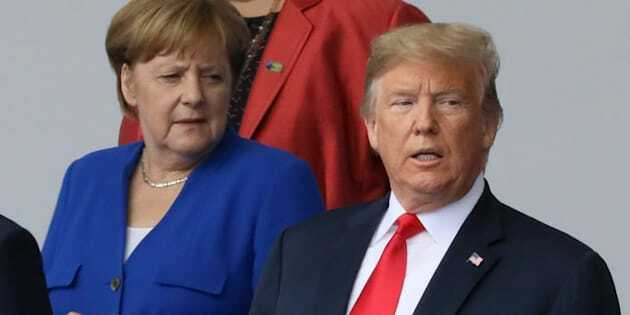 German Chancellor Angela Merkel and U.S. President Donald Trump are seen as they pose for a family photo at the start of the NATO summit in Brussels, Belgium on July 11, 2018. The Trudeau government and the Trump administration have found a rare patch of common ground at the NATO summit in Brussels — shared concern about a proposed Russian pipeline that would cross through the Baltic Sea into Germany. German Chancellor Angela Merkel — who grew up behind the Iron Curtain in communist East Germany — shot back at Trump. "I'm very happy today that we are united in freedom as the Federal Republic of Germany, and can thus say that we can determine our own policies and make our own decisions — and that's very good."